Transform your entryway with a door from us today. Make a new first impression with doors from BSG. 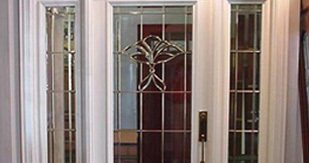 Bell Stained Glass your exclusive local Glasscraft Door dealer!!! You won't find doors like ours anywhere else in town. Home depot and Lowes carry doors, but of a much lesser qualirty and limited selection. They also do NOT allow you to customize your glass to your liking. You get that all here, at great prices. We welcome any ideas you might have about your new doors, whether they be from picture clippings or an idea in your head, we will do it all for you! I don't see any pricing listed with the doors, how can I get an estimate? When dealing with a church committee, you sometimes can have many differing opinion. 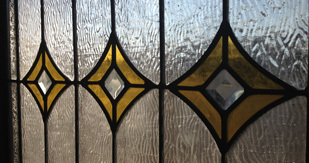 The folks at Bell Stained Glass worked with us every step of the way to ensure that we received windows that we all loved, I'd recommend them to anyone." What is the standard turnaround time for your doors? I wanted a nice classy and simple way to add value and beauty to the home I was putting on the market. Couldnt be much easier than replacing a front door. They did everything from install the door and hardware to staining the door as well." 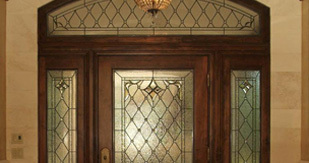 Do you refinish and repair glass in older doors?